This simple yet satisfying soup promotes good digestion and is a popular way to start off a rich meal. Georgian yogurt (matsoni) tends to be tarter than the yogurt we find in American grocery stores, so I suggest adding a bit of sour cream to approximate that flavor. If you make your own yogurt, you can achieve that flavor without sour cream—just leave the yogurt to ferment a bit longer. 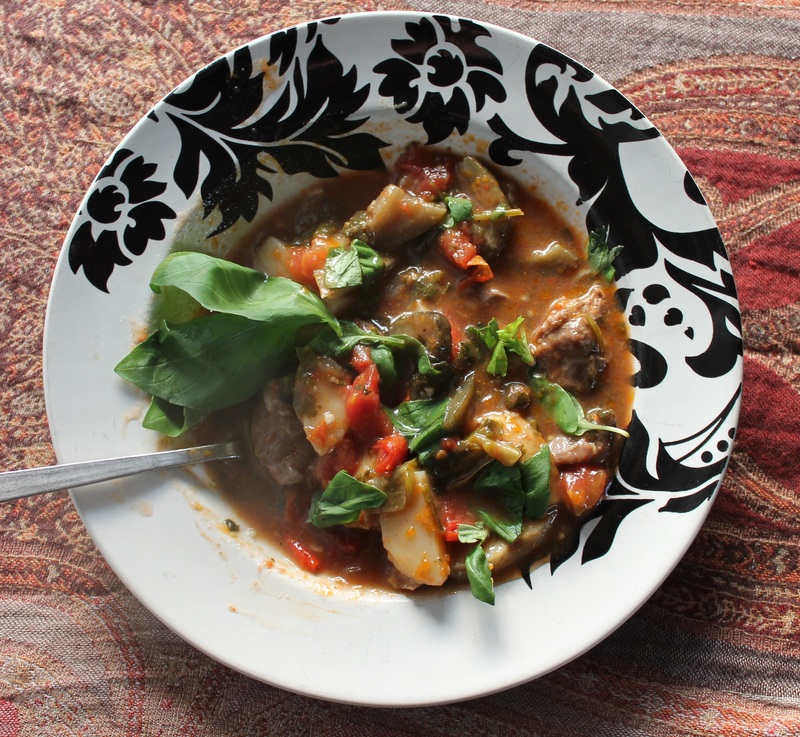 This soup does not reheat well, so make only as much as you plan to eat right away. Serves 4. Heat the oil in a large saucepan. Add the onions and cook until totally soft, 15-20 minutes. Meanwhile, puree the yogurt, water, egg, salt, and garlic together in a blender or food processor. When the onions are soft (taste a few to make sure you’ve cooked the crunch out entirely), add the yogurt mixture to the pot and bring to a steaming simmer, stirring continuously to prevent the milk solids from burning. Simmer about five minutes, until the taste of the flour has been cooked out. If the soup seems too thick, add water to suit your preference. Taste for salt and add more if necessary. Garnish with minced herbs and scallions and serve hot. 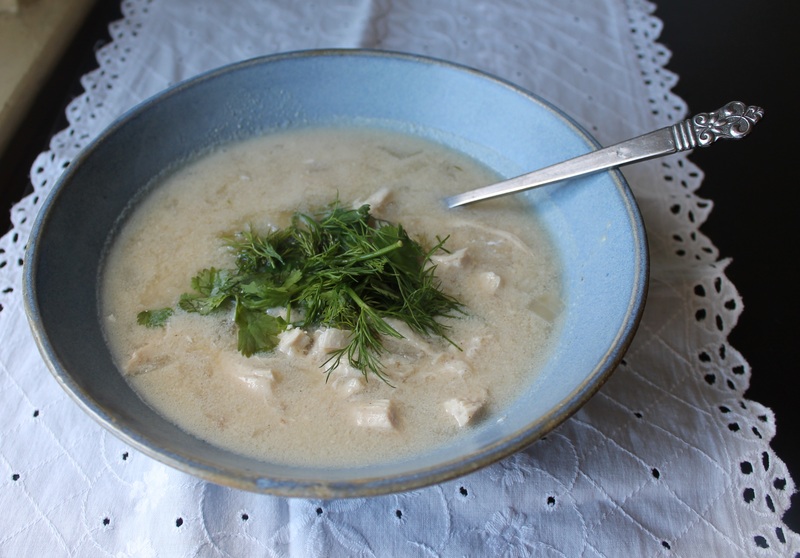 The Georgian palate gravitates toward tart flavors in all sorts of dishes, and soups are no exception. This elegant chicken soup takes its tang from lemon juice (or, alternatively, vinegar). It appears creamy due to the addition of eggs, but it contains no dairy. The hint of cinnamon adds a touch of sweet perfume, but the flavor remains delicately savory. I like to serve this soup as a first course before a vegetarian entrée, or as a meal in itself with a thick slice of grainy bread and a mixed green salad. *Tip: Roll the lemon around on the counter, pressing down on it hard with the palm of your hand, before slicing it in half and juicing it. This softens the membranes inside the lemon and will allow you to squeeze more juice out of it. Place the chicken breasts in a pot and pour the water or stock over them. Bring the liquid to a simmer (not a boil) and maintain it there until the chicken is cooked through, about 15-20 minutes. Remove the chicken and strain the liquid through a fine-mesh sieve. Reserve the strained broth. Use your fingers to shred the chicken into bite-size pieces. In the large pot, cook the onion in butter or oil until soft, about 15 minutes. Sprinkle the flour, salt, coriander, and cinnamon over the onions, stirring well to combine. Add the strained broth to the onions and bring to a simmer. In a separate bowl, mix the beaten eggs and lemon juice with 1 cup of the warmed broth, stirring constantly to prevent the eggs from clumping. Add the egg mixture to the soup, stirring as you pour. Add the chicken pieces back to the soup and continue to cook, stirring occasionally, until heated through. To serve, ladle the soup into shallow bowls, grind a bit of black pepper over each and top with chopped herbs. Serving suggestion: if you like a garlicky soup or are trying to ward off a cold, add 3-5 cloves of minced garlic to the soup when you add the chicken pieces back in towards the end. This hearty stew is traditionally baked and served in individual clay pots called chanakhi, which is where the dish gets its name. It’s also the custom to make slits in each eggplant and stuff them with herbs and chunks of lamb fat before layering them into the stew to braise. Most Georgian home cooks today make a simpler version like the one I present here. My notes from the time Shushana (my host mother in Batumi) and I cooked it together make me laugh now. Apparently the gas ran out midway, so Shushana had to call the utility company to bring out a fresh propane tank. My host father Misha wandered in to find out what the holdup was, then spread a layer of sour cream on some bread to tide himself over while I drank a glass of homemade Cornelian cherry juice and Shushana tackled the dishes. My host sister Diana came home with a scarlet red dress she’d found for her engagement party. Half an hour later, the guy from the gas company showed up to screw in the new tank on the balcony. We were back in business, the stew again bubbling away on the stove. (Shushana preferred the stovetop to the oven, which is where she stored her pots and pans.) “Now I remember why I never make chanakhi,” Shushana chuckled as we sat down to eat around 11 pm. This is certainly not a recipe to whip out in a time crunch. Luckily it’s the kind of dish that actually tastes better the second and third time you reheat it, once the flavors have had a chance to meld. I’d advise making it a day ahead of time. Preheat the oven to 350 degrees F. Arrange the oven rack so it is in the bottom third of the oven and there is enough room above it to slide in the pot you’ll be using with its lid on. Toss the eggplant slices with a good handful of kosher salt, mixing to coat. Set aside for half an hour, then use your hands to knead down the eggplant slices, squeezing out their dark juice as you go. Rinse well and pat the slices dry on a dishcloth or paper towels. Heat 2 Tbsp. of the oil or butter in a large Dutch oven or deep enameled cast iron pot with a tight-fitting, oven-safe lid. Brown the lamb over high heat, 2-3 minutes on each side. Remove lamb to another dish and set aside. Add the remaining 2 Tbsp. of oil or butter to the pot and heat. Add the onion and cook until softened, about 3 minutes. Add half the minced garlic and cook for another 30 seconds or so, stirring, until you can really smell the garlic. Turn off the heat or remove the pot from the burner (if using electric stove). Add the lamb back into the pot and stir to mix with the onion and garlic. Add the contents of the can of tomatoes (with juice), the red wine vinegar, and the remaining 1 tsp. of salt. Then layer half the potatoes, eggplant, peppers, and herbs on top, each in its own layer. Repeat with the remaining potatoes, eggplant, and peppers, continuing to layer. Add the fresh diced tomato on top. (Your vegetables will likely be nearing the top of the pot at this point.) Pour 4 cups of water over the vegetables. Do not stir. Cover the pan and bring to a boil over high heat. Do not stir. Move the pot to the oven and bake for 1 ½ hours. Remove the pot from the oven and increase the temperature to 400 degrees F. Add half the remaining herbs and the rest of the minced garlic to the pot. Put the to back in the oven, uncovered, and bake for 15-20 minutes more, until the broth has thickened slightly. Serve hot with crusty bread. Sprinkle the remaining herbs over each serving at the table. Chakhokhbili is a lot easier to make than it is to pronounce. (The “kh” sounds like the “h” in a Russian-accented “hello,” or the “ch” in the German “ich.”) While you can certainly find this dish on restaurant menus in Georgia, it is equally likely to show up on weeknight dinner tables at home because it comes together quickly and is the kind of thing you can make a big batch of and then easily reheat the leftovers for another meal (or two or three, if there’s only one of you). 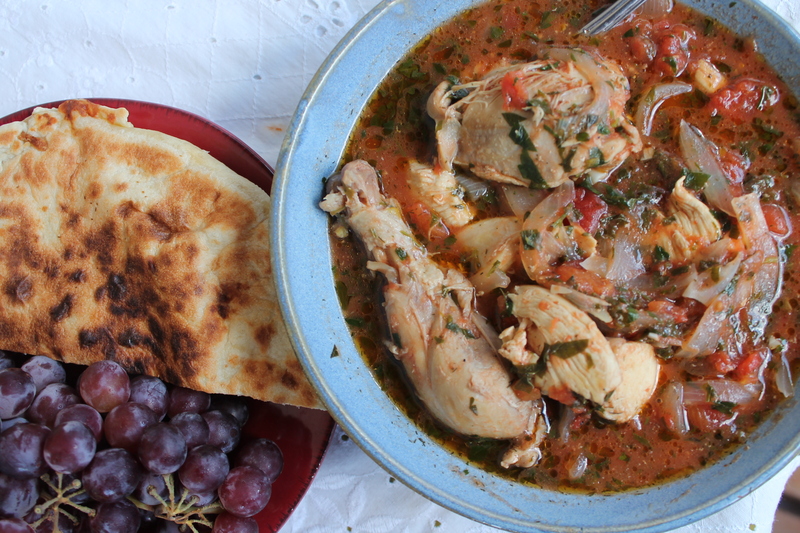 The dish’s name comes from the Georgian word for pheasant (khokhobi), and if you happen to have a pheasant on hand, you can substitute it for the chicken in the recipe. You could also use turkey, duck, or Cornish game hen. In Georgia today, chicken is the most common bird used for this recipe. My Georgian host mother Shushana used to serve chakhokhbili with the slightly salty, pully bread she’d pick up at the bakery across the street from our apartment building. It was perfect for mopping up the last sweet, tomatoey juices from our plates. Serve yours with fresh baguette, Middle Eastern flatbread, or sturdy cornbread. You can also ladle it over basmati rice. Note on herbs: Georgians often use both the leaves and stems of fresh herbs unless the stems are particularly tough. If you dislike the sharper taste of the stems, feel free to discard them before chopping. Heat butter or oil in a large pot, Dutch oven, or cast iron skillet until it begins to sizzle. (You can use any heavy-bottomed pan with high sides, but avoid nonstick pans, which keep things from browning properly.) Add the chicken, salt, pepper, and cayenne, stirring to coat. Brown the chicken lightly on all sides. Remove the chicken from the skillet and add the onions and bell peppers. Cook over medium heat, stirring frequently until softened, about 5 minutes. Add the garlic until it turns fragrant, about 30 seconds. Add the tomatoes with their juice, the other spices, the vinegar, and half the herbs, stirring to combine. Bring the stew to a boil, then reduce the heat to low and add the chicken back to the pan. Simmer, covered, until chicken is cooked through, about 15-20 minutes. Stir in the rest of the herbs and adjust salt, pepper, and cayenne to taste. Serve with crusty bread, flatbread, mchadi, or over basmati rice.